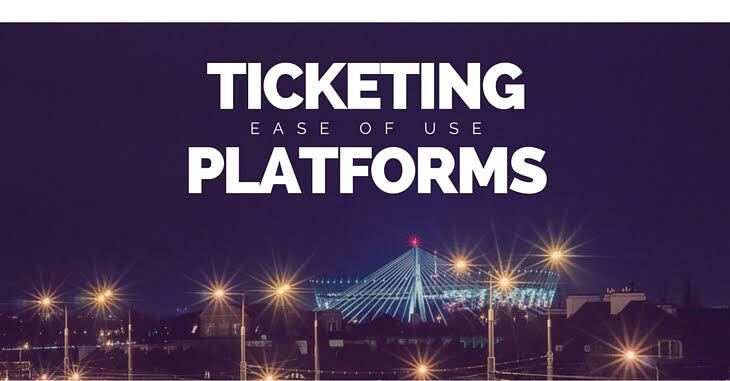 This is the first in a 3 part series about online ticket platforms. Over the next few weeks, we will break down the nitty-gritty of each platform, and help you figure out which one is best for you. If you are an event promoter, you need to sell tickets. Every day the world gets more and more connected to the internet. More people than ever are buying their event tickets online. There are a wealth of services that help you with this, but which one is right for you? If you want to know which platform is the easiest to use, this is the right place to look. We’ve evaluated the best platforms based on their ease of use. Check out below for the inside scoop. Eventbrite is so simple to use, even a child could figure it out. You simply sign up with an email account and create your event page. A web form asks all the important questions: title, venue name, street address (handily embedded in Google Maps), date, start time and end time. You can enter your company logo, and create recurring events. Your event description can be created using plain text or HTML. You can make an FAQ page, add your organizer name, and create social media links. The service allows you to add paid, free and donation-based tickets. Eventbrite charges a ticket fee. Their service allows you to absorb these costs yourself or pass it on to customers. You then select the event type, topic, and choose whether to show the remaining available tickets on the page. All of this is just in one easy web form. If you’re familiar with WordPress the Eventbrite will be a breeze. From there you choose a theme and you’re pretty much ready to publish your event. If you don’t tinker with the HTML, creating an Eventbrite page takes less than five minutes. It doesn’t have all the bells and whistles associated with other platforms, but it’s easy, quick, and effective. Ticketmaster uses a full-service model – their ticketing goes end to end. Before you can use Ticketmaster you’ll need to speak with a customer service representative to determine whether your event is a good fit for the company’s services. The Ticketmaster team will then develop a tailored solution for your event and budget. There is a self-service option for organizing ticket sales, or you can let their team do all the work for you. They have everything your need – sales figures, reporting, marketing, merchandise, and social media campaigns. Ticketmaster’s team will also help determine the correct price point for your event. If you’re looking for a company that can handle pretty much everything for you, this is the easiest option. Their huge presence gives great advertising potential. With a large end-to-end solution, you can tailor the bits and pieces you’d like to include. The downside to all these perks? Cost. Ticketmaster isn’t cheap. TicketFly is another heavy duty ticketing platform. With TicketFly Backstage, you can easily manage your event information, artist information, marketing, appearance, members, orders, reports, box office and bouncers. The website’s layout is simple and intuitive. The “event information” displays the date, venue, sponsors, ticket text, ticketing, etc. TicketFly’s “artist information” section gives you access to their artist database. Here you can easily grab useful data or add your own. The section is quite comprehensive, and makes things simple and quick. Once you’ve created your event you have the opportunity to “amplify” it to Facebook. This automatically creates a Facebook event, which you can share on your wall. All of this happens without you needing to actually go to Facebook. You can amplify with Twitter as well, which will schedule posts like “on sale now” for important dates. TicketFly’s Backstage platform is very easy to use and provides control over almost everything. If you can think of it, there is an option to customize it. TicketFly can also build customized websites that feature all your upcoming events. It can show Facebook likes, upcoming shows, YouTube clips, RSVPs, etc. This is all based on the data you enter on TicketFly’s main page, but you can customize the page as well. All in all, TicketFly is a comprehensive platform that is still easy to navigate. It gives you a custom webpage for all of your events and lets you change almost anything you like. Win-win. Splash is the perfect platform for visually oriented people. Splash helps you build your own ticketing page based on designs you like. With Splash, you fill in some basic information like event name, date, time, venue and hashtag for use in social media. Next, you choose from several gorgeous themes, fonts, and layouts. You can edit all of these with a drag-and-drop visual editor. Objects called blocks enable you to layout sponsor logos, lists, and schedules. You can easily add a gallery feed to your site too. The visual editor also allows you to enter ticket info, analytics, and schedule mail outs and RSVPs. Splash has a great range of help resources on offer too. If you want a beautiful custom website, this is the ticketing solution for you. TicketLeap is not too dissimilar from Eventbrite in its setup. You enter basic event information and ticketing via easy-to-understand forms and then pick some simple pictures and layouts to match your brand. It’s extremely easy to run through your initial setup and tweak from there. There aren’t as many options as TicketFly, but with many events you don’t need them. TicketLeap creates your webpage, which shows the event’s time, location, about page, and a place to buy tickets. However, TicketLeap has a real focus on social media. The service displays your social media feeds on your page, making this a good option for those with a strong social media presence. The platform even pulls your event hashtag from both Twitter and Facebook to display what people are talking about on your main page. You can set up your analytics to track sales through “invite a friend” campaigns, Facebook likes, and comments posted to Twitter. You can easily post to your feed and see the effects all from within the platform. Tracking codes can show where your sales are coming from too. You need to put in the work to optimize TickeyLeap for social media interaction but if you do it will be worth the effort.